I was gathered with 450 seasoned land conservation professionals. The speaker who spent a chunk of time on climate science lost me. I imagine the majority of attendees at this event already believed in climate science, but were hungry to understand more about climate solutions. Which leads me to tip #1: know your audience. 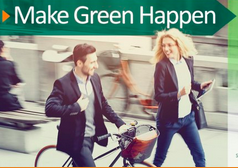 Customize your speech to fit the attitudes and background of those you are speaking to. Take the time to consider their expertise, experience, political orientation, and culture. Then speak to this audience. What do they care about? What do they already understand? What do they want to know? Consider chatting with someone who has spoken to the same group before to get a sense of the audience and ask the host for some details. Does your speech have a quote that is easy to tweet? I was listening to each speaker for Tweetable moments and came up empty handed a few times. Tweetable quotes are short, catchy messages in your speech that can easily be shared on Twitter with a powerful image. 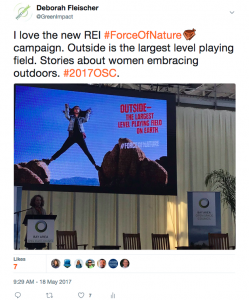 The catchiest tweet and image of the day for me was part of the REI presentation on its new campaign: #ForceOfNature, a campaign aimed at women embracing the outdoors. Give your Audience a Discrete Action Item. 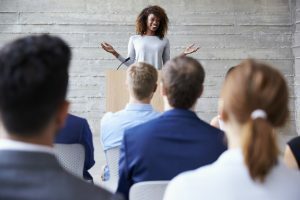 Audiences love to come away from a speech feeling motivated. Take advantage of their current motivation and give them an immediate, specific action item. 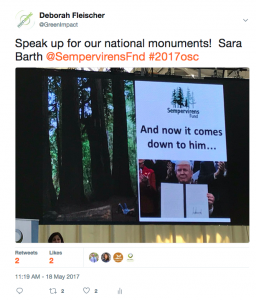 For an audience of land conservation professionals, I found the clear, specific call to action to “speak up for our national monuments” impactful. 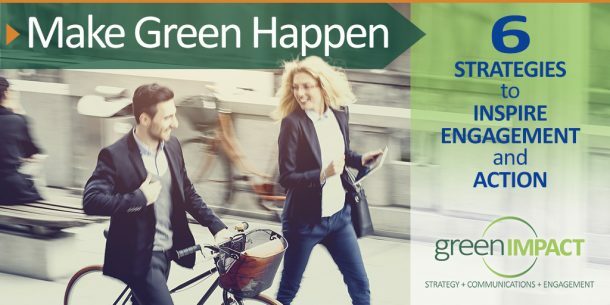 Create a call to action that is tailored to your audience and actionable. 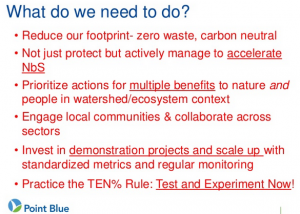 A long list of action items can be overwhelming.